Embroiderers' Association of Canada, Inc.: Kelmscott Registration Extended! The Kelmscott cyber course registration deadline has been extended to September 30, 2017! EAC’s most recent cyber course Kelmscott has not received the excitement I had expected. I apologise to EAC members for not thinking about the summer period when people are more relaxed and less focused on learning opportunities. 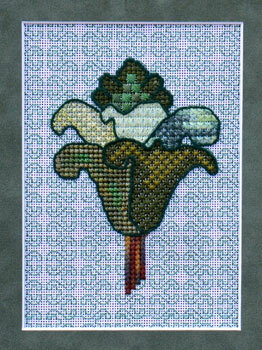 In addition, I forgot to include Lorene Salt’s beautiful canvas work design in the spring issue of Embroidery Canada. My humble apologies to Lorene for my oversight. It was on our EAC website under Education. As your current Education Director, I have been busy trying to make improvements to the EAC educational program, as well as meet the EAC timelines for submissions for Embroidery Canada and the regular eThreads postings. I hope members will bear with me as I try to add new courses in various styles to entice and enhance increased interest in your stitching passion. Lorene has agreed to extend the registration for Kelmscott to September 30, 2017 with online lessons starting November 1, 2017. Three lessons (one lesson per month posted November 1, December 1 and January 1) are planned so this cyber course will run until February 28, 2018. We normally include an additional month after the final lesson for final cyber discussions and photo. Check the EAC website for all of the details and for easy, online registration! No kit is available for this cyber course but Lorene tells me that there is minimal thread lengths used in Kelmscott. So this could be a great stash buster for members. Lorene will provide a substitution chart and materials list to students as soon as the revised September 30 registration closes. If you don’t have a particular thread, substitute, change colours. Be sure to share your photos as your Yahoo group will enjoy seeing the variety of colours and threads used by each participant. Maybe you can even convince Lorene to have a “Client Gallery” to show off your uniquely stitched Kelmscott in a variety of colours. I promise I will watch when I write the contracts with the designers so cyber course registration does NOT happen during the prime summer vacation period.